Biography of Italian Gothic Sculptor/Architect. Trained in Gothic sculpture, the Italian sculptor and architect Andrea Pisano - also known as Andrea da Pontedera - was an important pioneer of prototype Renaissance sculpture of the trecento. 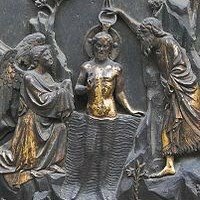 His chief works were executed in Florence, the most important of which were his three bronze doors for the baptistery of the Cathedral of Florence (completed in 1336). An important forerunner of the courtly International Gothic style of art, he was highly influenced by the sculpture of Giovanni Pisano and the renaissance artist Giotto. Born in 1295 in Pisa, little is known of Pisano's life. He began working life as a goldsmith, the training for which would prove useful to him in years to come. It is also supposed that he became an apprentice to Giovanni Pisano and worked with him on a sculpture for the Santa Maria della Spina church at Pisa. It is also suggested that he may have worked on St. Mark's and the Doge's palace in Venice. At some stage Pisano moved to Florence where he came under the influence of Giotto, who was the chief architect of Florence Cathedral. Under his guidance, Pisano produced three bronze doors for the baptistery. The panels of relief sculpture took several years to complete - completed in 1336 (the date on the door says 1330, but his refers to the wax model and not to the casting). The figures are gilded and set against a smooth bronze surface. A beautiful work of Christian art, the iconography of the door displays influences of Giotto's frescoes in the Basilica di Santa Croce and the architectural design of the door are similar to those at Pisa's cathedral. Pisano's style is simple and restrained; his figures are carved with great skill and expertise. No doubt he would have been highly regarded in his time. Giotto is celebrated as an artist for many reasons, but one of those reasons is that he managed to break from the influence and tradition of Byzantine art. Byzantine art covered decorative sculpture, stone-carving, metal and ivory works, ornamental bronze work, enamelling and the art of miniature-painting. The style that characterized Byzantine art was highly sophisticated and developed but also rigid and uniform. Giotto breathed new life into religious subjects and inspired other artists and sculptors, including Pisano, to do so too. On the death of Giotto in 1337, Andrea Pisano succeeded him as chief architect of Florence Cathedral, and was charged with the construction of the Campanile (bell tower). He added two stories and adorned the panels with sculptural reliefs. By this stage Pisano had his own studio and pupils - and it was under his guidance that his pupils created the reliefs, depicting scenes from Genesis, the arts and science. Other subjects depicted included the Four Great Prophets, the Seven Virtues, the Seven Sacraments, the Seven Works of Mercy and the Seven Planets. Several statues, which were originally placed in niches in the Campanile above the reliefs depicting David and Solomn and two Sibyls have been attributed to Pisano, but this is disputed. The reliefs, along with two statuettes of Christ and Saint Reparata are now housed in the cathedral's museum. For more details concerning the Florentine duomo, see: Florence Cathedral, Brunelleschi and the Renaissance (1420-36). In order to appreciate important 3-D artists like the Gothic sculptor Andrea Pisano, see: How to Appreciate Sculpture. For later works, please see: How to Appreciate Modern Sculpture. In 1347 Pisano was appointed Chief Architect of the Duomo of Orvieto (14th century Roman Catholic cathedral situated in the town of Orvieto in Umbria, which was designed and started by Lorenzo Maitani). Construction had begun in 1290 but lasted almost three centuries with the design and style evolving from Romanesque architecture to Gothic architecture as construction progressed. When Pisano died a year later, he was succeeded by his son, Nino. His other son, Tommaso was also a well known sculptor and his most distinguished pupil was Andrea da Cione, (painter, sculptor and architect) also known as Orcagna.  For the history of Gothic sculpture, see: Homepage.